I have been excited for awhile to take part in the annual October 31 day writing challenge at Write31Days. I could not bring myself to begin writing about one more thing until I completed the list of correspondence that was growing in my head and filling my heart. My God cares so deeply about people and relationships that He provides the glue of words, communications and encouragement from His heart to each of us via the mouths of other people. 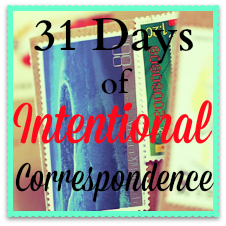 I count on His grace and direction as I write 31 Days Intentional Correspondence this month that communicate the heart of The Father. I pray that his endless love will be poured out. Please come back and visit this page often, as I will be updating it with all of the posts in this series.